How not to start the spring: first you plant the spring garden. Then the deer eat all the seedlings. Then you plant it again. That night there is a severe storm that dumps 3 inches of rain onto a freshly tilled garden, washing away a lot of topsoil, and most of the onions. But seriously, I suppose we should count our blessings. There were multiple tornadoes out of that storm, and many people suffered damage that makes ours seem trivial. I put out a few bales of hay, like bandages on the erosion wounds. Hopefully we won’t have any more gully washers before the crops are set. Unfortunately I had to go to the airport to return to Florida before the Timm family arrived. But as I type this they are settling into White Flint Farm. The farm is happy to have them. Last year I discovered Relevant Church in Tampa. Led by a great group of loving, genuine and unpretentious folks, the church meets in the Italian Club in Ybor City. It is a very casual atmosphere, with really great music and visuals. Although they seem to be more oriented to the 20-something crowd, even a decidedly unhip middle-ager like me felt very welcome there. One of things about Relevant that greatly impresses me is their outreach to the local community. When the church started up a few years ago, they went out into the surrounding neighborhood and did yardwork and handyman tasks, for free, for the community. A lot of poor and disadvantaged people live in that area, and it was great way to say hello to them. One of the neighbors who received their help was an old black woman who hadn’t been to church for many years. Now she is on the front row at Relevant every Sunday. Recently Relevant launched one of the coolest things I’ve ever known a church to do. They have partnered with Booker T. Washington Elementary, the local public elementary school, to mentor and tutor the poor and underprivileged children there. At first there was some resistance from some of the administrators, who feared they might be planning to evangelize the kids. But now they’re embraced. This is a school that the county prefers to forget, and many of the children there have zero support from home. The people of Relevant are giving up their time to work one on one with these kids and it has made a big impact already. In fact, three of the teachers and an assistant principal are now attending Relevant as a result. A friend of mine attends Relevant regularly, and he is one of the B.T. Washington volunteers. He is mentoring a dirt poor boy, whose single mom has made it clear to the boy that she couldn’t care less what he does or where he goes. My friend told me that he used some coins from his pocket to illustrate a math problem, and when he was finished he gave them to the boy. It was about 60 cents. The boy was very excited, as he’d never had that much money before. Later the boy’s teacher told my friend that the boy contributed all the money to a collection the class was taking for a luekemia victim. The little boy lives in the projects on the edge of downtown. He can see the tall buildings (Tampa’s version of skyscrapers) but they are a world away from his life. My friend said the little boy lit up with joy when he said he’d take him up to his office on the 38th floor. This little boy, and many other kids in that school, are having the life-changing experience of being helped and loved by total strangers, who genuinely care about them. Over 50 Relevant church members are serving these kids, who otherwise would have no adult mentoring at all. That is doing what the church is supposed to do. They are making a difference in lives of neglected children and they are walking examples of God’s love. Maggie seems to be recovering. Cherie just would not give up on this goat, and her TLC, combined with Maggie’s toughness, is paying off. Maggie now has an appetite and far more energy than she had a few days ago. I was convinced she wasn’t going to make it. Now, even though she’s not out of the woods yet, I’m convinced she will. The deer ate my broccoli. Discovering that was infuriating. I worked hard to get it planted during my brief trip home last weekend. They ate all my fall broccoli after the first cutting, but I hadn’t expected them to eat my spring seedlings. So I replanted it all. And I planted two rows of cabbage. And this time, I put up the deer fence. 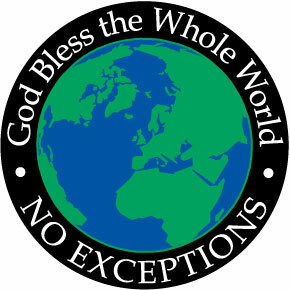 But once in Tampa I saw a bumper sticker that said, “God Bless Everyone. No Exceptions.” I really liked that. Wouldn’t it be cool if we sought God’s blessing not on our tribe and its warriors, but rather on the whole world? If I hadn’t been too tired or lazy I would have included some of these in the posts from a few days ago. the rows are not crooked. That is an optical illusion.